We’ve added a new feature to enhance the protection of our clients, and to give you the ability to report real-time changes in price and quantity of your listings. 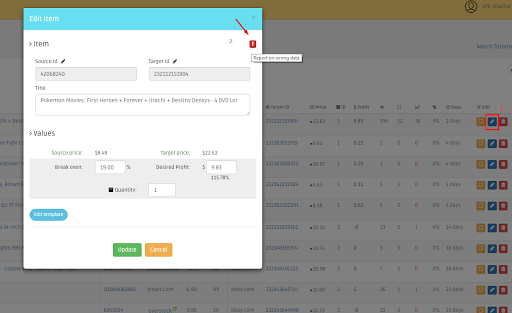 – This option will let you manually edit product information that has discrepancies, and will save your time on the next scan of the monitor. If you see any incorrect price or quantity in your account you can report it. 1. Go Price Monitor page. 2. Choose the product that you would like to report, and click blue pencil button to edit. 3. Click on the red exclamation button above to get an immediate scan of the same product. Note: The process may take several minutes. Contact us in case you have any questions.